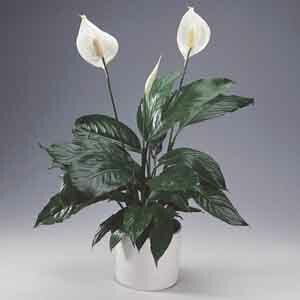 Peace Lilies are highly valued as houseplants for their ease of care. The leaves will begin to droop very obviously when the plant is thirsty, then quickly perk back up once it is watered. The smooth glossy leaves compliment any décor and they group well with other houseplants. Interesting, spoon-like white blooms add to the Peace Lily's appeal.